The Dundee and Newtyle Railway (the first railway north of the River Tay) obtained its Act of Parliament before Stephenson’s ‘Rocket’ ran at Rainhill, yet its important place in the early history of the railways of Scotland in particular, and the United Kingdom in general has received little recognition. The line was originally built to 4 ft 6 in. gauge, with rope worked inclines en route. The inclines were eventually eliminated and the route converted to standard gauge. 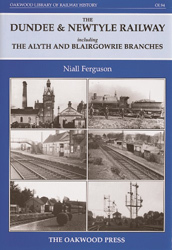 It is impossible to write a history of the Dundee and Newtyle Railway without also describing the branches to Blairgowrie and Alyth, whose operations were intimately linked with the Dundee and Newtyle, so their histories from construction to closure is also covered. A5 format, 248 pages, 125 photographs, 53 maps / plans / drawings.